U.N. vehicles hit by explosion in Syria | Life is short,have fun!!! 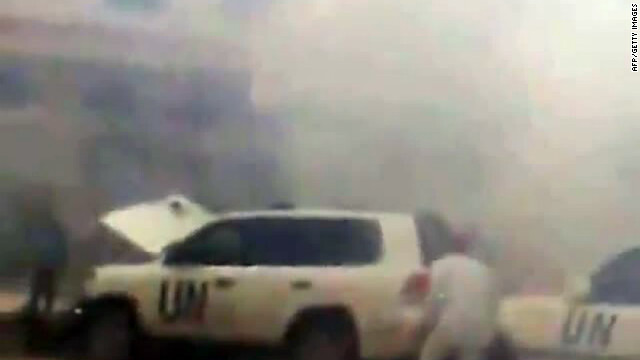 An image grab from Youtube on May 15, 2012 allegedly shows a UN observers convoy after a roadside bomb exploded. (CNN) — A four-vehicle U.N. convoy was struck by a blast from an explosive device Tuesday in Syria, the United Nations said. No U.N. personnel were injured, but three vehicles were damaged, said Ahmad Fawzi, spokesman for Kofi Annan, special envoy to Syria for both the United Nations and the Arab League. The attack on the vehicles happened around the same time government forces opened fire on a nearby funeral procession, according to opposition groups. Twenty-three people were killed and 100 were injured in that attack, Avaaz, one of the groups, said. Another opposition group, the Local Coordination Committees of Syria, described dozens of people falling to the ground after government forces fired on them using heavy machine guns. Shoes are strewn about on the street and people can be seen gathering near the stopped vehicles. Suddenly, there is a loud bang and plumes of smoke drift up into the sky. The camera flashes to what looks to be the front of the U.N. convoy, showing one of the vehicles with its hood now popped open. After a few seconds, the vehicles drive away. “The Assad army is shelling the observers’ vehicles in Khan Cheikhoun!” someone yells. A second video allegedly shows the attack on the funeral procession. A voice taunts what appears to be security forces. “Are you going to shoot us, or what? You dogs, shoot!” the man shouts. Seconds later, the forces open fire and people scatter, fleeing the area. Idlib was the site of some of the heaviest violence Tuesday, according to the opposition Local Coordination Committees of Syria. At least 63 people were killed, including 33 in Idlib, eight in Homs, seven in Deir Ezzor, five in Hama, four in Banyas, four in Damascus suburbs, one in Hasakeh and one in Daraa, the group said. 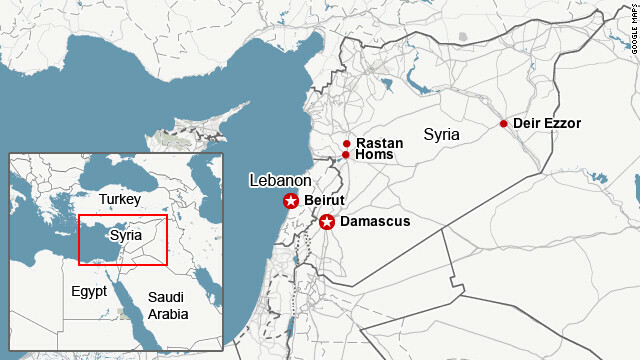 SANA, the state-run news agency, said terrorists were preparing a bomb in Banyas when it exploded, leaving “scores” of people dead or wounded. A 3-year-old child died in the collapse of the building, SANA said. Two law enforcement personnel were killed — one in Daraa and one in Homs, the agency reported. The jihadist Al Nusra Front has denied a claim that it was behind dual suicide bombings that killed 55 and wounded hundreds in the Syrian capital last week. Syrian forces carried out a siege Tuesday at Raqa University in northern Syria after a massive demonstration and fired live ammunition at a college student demonstration in Aleppo, the Local Coordination Committees said. Some rebels say they have had to sell their cows, cars or their wives’ jewelry to buy guns and bullets to fight. The al-Assad family has ruled Syria for 42 years. International pressure against al-Assad’s government ratcheted up this week, with European Union foreign ministers imposing new sanctions against the regime Monday. The EU ministers froze the assets of two firms and imposed a travel ban and asset freeze on three people believed to be providing funding for the regime, the European Council announced. It was the 15th time the European Union has imposed restrictions on Syria since the popular uprising began there. Just 300 yards from the Syrian border, hundreds of Syrians have found safety at a Turkish refugee camp. Though they have fled the fighting, many are haunted by memories of the 14-month-long bloodshed. Abu Mohammed recalled how two of his sons had been fatally shot by security forces while demonstrating in Syria about a year ago. Another son is missing, believed to be arrested and possibly killed without ever having met his 7-month-old son. Mohammed said he cannot justify the Syrian security forces’ actions. He knows why his sons spoke up and why many are still fighting. But the Syrian government Tuesday touted “the widest turnout of voters for Syrian parliamentary elections,” which took place May 7. “The citizens exercised their full rights, and they had total freedom in choosing their representatives,” Judge Khalaf al-Azzawi, chairman of Higher Committee for Elections, said on state TV. The United Nations estimates that at least 9,000 people have died in the 14-month crisis, while opposition groups put the death toll at more than 11,000. CNN cannot independently verify reports of deaths and violence because the Syrian government has severely restricted access by international media.